PowerEC ENC is an automated system for surface inspection of cold bar, wire or tube for point and transverse defects. 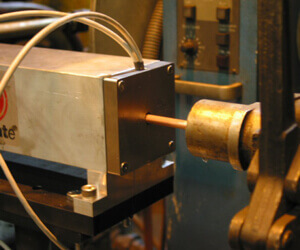 Non-contact rotating Eddy Current technique. In-line or off-line and fully automated. Inspects all cold rolled or drawn metals including carbon steel, copper, nickel, titanium and aluminum. 2mm to 230mm (0.08” to 9.05”) diameter. Temperature 0°C to 70°C (32°F to 158°F). Continuous or discrete inspection at production speeds. Detects point and transverse defects to 0.05mm (0.002”) in depth. Robust mechanicals for precise product control, fast changeovers and low maintenance. Segmented magnetizer/demagnetizer to boost signal and improve defect detection. Exclusive research tools for post inspection analysis and long term improvement. Searchable database by lots, steel grades, diameter and any other recorded parameter.